In the face of the results from the recent Wisconsin recall election, several congratulations are in order: Congratulations to Governor Scott Walker for retaining his position of power, even in the face of a massive populist rejection of his policies. Congratulations to Walker for proving that, with enough money, even the most disliked and obviously corrupt politicians can remain in power. Congratulations to Walker for becoming the living example of why money must be removed from politics. Governor Walker’s attack on public sector union collective bargaining during the creation of the 2011 Wisconsin budget caused a virtual firestorm in the Wisconsin political landscape. Huge protests, including a massive sit-in at the statehouse, demonstrated just how controversial the union-busting amendment was to the general population. The reaction to the union-busting measures pushed by Walker became so extreme that numerous Democratic legislators actually fled the state in an attempt to block cloture (preventing a vote) on the budget. Unfortunately, the removal of collective bargaining rights eventually passed through the legislature - through the use of a highly controversial procedural loophole - and was signed by Walker. Throughout much of 2011, a large number of union and Democratic groups gathered signatures and organized in order to bring about recall elections of the politicians who support the union-busting measures. After a lengthy process, far more signatures than required were turned in and the recall was set. Unfortunately, a loophole in the Wisconsin election law, allowing for unlimited donations during recall elections, combined with the Citizen’s United V. FEC Supreme Court decision led to a situation where a figurative tsunami of money entered Wisconsin politics. The Wisconsin recall election has become a crystal ball into the future of American politics – a future where unlimited amounts of money are donated by anonymous billionaires and used to carpet-bomb the public with deceptive ads. 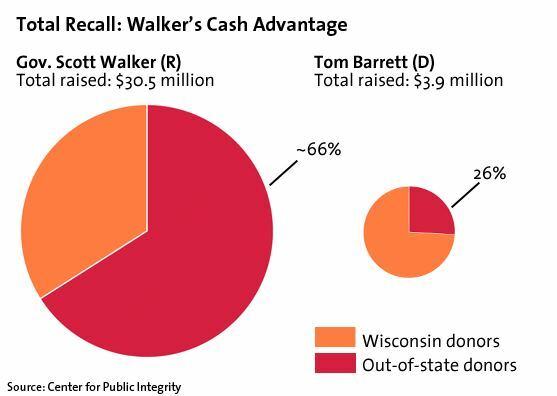 As you can see in the graphic, Scott Walker raised nearly eight times the amount of money then Tom Barrett, the Democratic challenger. A resource disparity of a factor of eight is absolutely ridiculous, and creates a virtually insurmountable obstacle for the party with the smaller amount of resources. With his vastly inferior resources, there was simply no way for Barrett to put up a credible fight against Walker. Unless we work to get rid of money in politics, it is likely that many future fundraising charts will look similar to this one – where the corporatist politician has virtually unlimited funding and the populist politician is left with virtually no way to fight back. It is an unpleasant fact that people are fairly easy to trick, given enough organization and money supporting the effort; unfortunately, corporate political groups have both the money and the organizational knowledge to trick people into supporting their politicians. The major operational effect of removing the limits on political donations is that those with money will inevitably attempt to propagandize others to support their interests (regardless of whether this interests support those people). As the general public is usually ignorant about the specifics of policy, political dis-information campaigns regularly convince people to vote against their own interests or support candidates who are obviously not the best people for the job. 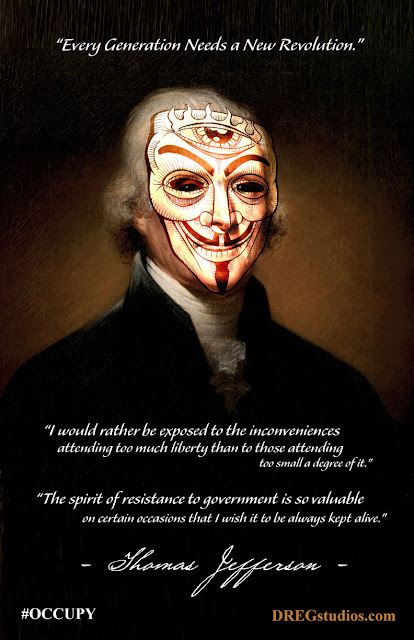 Not only has the removal of donation limits led to the public being constantly bombarded with partisan propaganda, but loopholes in disclosure rules have led to thes campaigns being virtually anonymous; we simply don’t know who is giving to many major political groups (Ex. Crossroads GPS). Money in electoral politics used primarily to buy advertising and promote messaging. In political races where resources are largely equal between the parties, there is no way for one group to simply saturation-bomb the opposition with negative ads; for every ad that one side takes out, the other can respond and mitigate it with an opposing ad. Unlike in races where resource levels of the sides are similar, in races where the resource differential is large (Ex. a factor of eight), one side can buy up huge amounts of ad-space and overwhelm the other. The side with more resources simply buys huge amounts of advertising and drowns out the opposing side through sheer volume of propaganda. We have seen this phenomenon in the Republican primary race, where Romney used his superior resources to bludgeon the opposition – weak as it was – into submission, as well as in the recent Wisconsin recall. In less than a year, the propaganda campaign of Scott Walker transformed the atmosphere of protest - which spawned marches and fueled a massive recall effort – into one where he was able to capture over a third of the union households of Wisconsin. Even while the video of Walker discussing his “divide and conquer” strategy of breaking unions with a rich donor and the now-infamous “fake-Koch brother” audio tape circulated the internet, Walker was able to convince nearly a third of union households to vote for him. Propaganda works, but it requires money to propagate; due to his selling out to the rich, who desired unions be suppressed, Walker had all the money he needed to keep his position. In addition to the sheer volume of cash spent during the Walker recall, the sources of such money are absolutely vital to the understanding of the recall results. A majority (66% or $20.13 million) of Walker’s money came from out of state groups and individuals - agents which don’t actually have any stake in the recall, as they are not residing within the area of effect for the governor’s policies. These interests are national corporate groups looking to set a precedent, where repercussions against politicians who support anti-labor agendas are minimal. If politicians are emboldened to attack unions, because they no longer need to fear populist reprisals, more state politicians will be willing to sell out to corporate interests. A minority (34% or $10.37 million) of Walker’s fundraising came from in-state corporate interests and wealthy donors. Many of these donors benefit greatly from the reduction of labor rights within their state, because decreased union power depresses the wages for everybody. Tom Barrett raised a majority (74% or $2.886 million) of his money from in-state interests; a majority of this money came from unions groups and smaller donations. These groups are most likely those that are affected most by the union stripping measures of Walker, thus they had a compelling interest in recalling him. A vast minority (26% or $1.014 million) of the money raised by Barrett came from out of state donors. These donors consisted primarily of concerned liberals and union groups looking to impose punishments against Walker for his anti-union agenda. Just as corporate interest from other states desire a precedent of no consequences for selling out to corporations, unions desire accountability from these politicians. Not only did Walker raise far more money from donors, but a huge percentage of his donations came from out of state groups. While in-state Walker fundraising overtook Barrett’s by a factor of 359.3% (an incredible number), Walker’s out of state fundraising absolutely eclipsed Barrett’s by a factor of 1985%. The fact that Walker’s fundraising is so heavily skewed towards out of state donation points to the fact that union busting by corporate interests is a national issue. Unions in Wisconsin wanted to retain the ability to collectively bargain, but corporations are looking at a multi-state strategy. In essence, the Wisconsin unions and Tom Barrett were looking to serve the interest of their supporters in Wisconsin, while corporations and Scott Walker were looking to advance the national corporate fight against unions. Realistically, unions and interest groups looking out for average citizens will never be able to compete monetarily against corporate groups and individual billionaire donors. Corporations simply have too much money and unions will never be able to compete on an even playing field. This fundamental disparity in resources, combined with a system of unlimited political donations, leads to an unbalancing of the political playing field: the rich and corporations gain an advantage and slowly take over the political system. As demonstrated by the Walker recall, money in politics has a clear and devastating effect on the race. On average, the side with drastically more money wins the race against the side with more limited resources. Corporate money flows to the politicians who sell out to the interests of these corporations – reducing corporate taxes/regulation and giving them contracts – thus the corporate politicians will eventually take over any area where money is unrestricted. The attempted recall of Scott Walker, precipitated by his attacks on labor rights in Wisconsin, was the first large test of corporate money versus people - Unfortunately, in this case, money won. While it wasn't surrounding a particularly important political position, in the gard scheme of things, the recall fight against the Wisconsin Governor gave us a window into the future of politics. Huge amounts of money, oftentimes donated from groups not affected directly by the results of the elections, swamp the population with messaging. This messaging convinces the population to vote against their own interests and creates a self-sustaining cycle of corporations buying election after election. We must remove money from politics, lest our entire system of government become little more than a public auction between different corporate interest groups. We, as Americans, must organize and prevent all future elections from being as unbalanced as the recent Wisconsin recall. It isn't too late to act against corporate power in elections but we must act now, before the corporate interests capture the government even more than they have already. The only feasible method of barring money from elections is through a constitutional amendment. Several groups are working towards this goal, but they need help. Please, regardless of partisanship, donate your time and resources towards one of these groups and join the effort to protect American democracy.